Over 25 years transforming your dreams into reality. Our expertise is the creation of professional landscape installations from the simplest to the most elaborate of designs. Castle Landscapes Inc. having been in operation for the past 25 years, has transformed dreams into reality. We have done this by skillfully and professionally combining years of experience, cost cutting consciousness, unsurpassed quality giving the customer confidence that they will receive a state of the art decorative design. 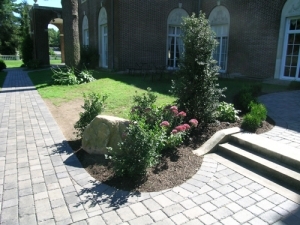 Long Island landscaping company, Castle Landscapes, Inc., is a family owned and operated full-service landscape contracting, design, masonry & maintenance company providing efficient, economical and professional landscape contractor services to the greater Melville, Oyster Bay, Smithtown, Syosset, Woodbury, Huntington, and Dix Hills areas. We are proud to offer our customers an array of landscape design, sprinkler system, tree care, and masonry services to meet whatever needs and demands life should throw your way. We carefully analyze existing site conditions and carry out the implementation of your landscape design project from concept to completion. Our services encompass an entire spectrum of quality materials and products for all aspects of landscaping to ensure maximum results and total customer satisfaction. We offer a solid selection of landscape contractor services that can be tailored to your individual needs Our services include Residential landscaping for your home or condo complex or commercial property, our residential and commercial masonry services are fast, efficient, and meticulous, our main concern is making sure you and your needs are met. If you are in need of a landscape contractor in Melville, Oyster Bay, Smithtown, Syosset, Woodbury, Huntington, Dix Hills, or anywhere else on Long Island, contact Castle Landscapes, Inc.